Trains. Architecture. New York City. Together, they're my perfect storm. So who knows why it took me this long to get back up to the NY Botanical Garden to see their Holiday Train Show. But, I loved it. No, seriously. I was completely floored. I mean, I've always heard about it, but let's be honest, unlike my mother who loves wandering around gardens, pen and paper in hand taking notes, I'm not exactly a botanical gardens kind of chick. But, as I made my way via Metro North, I didn't know what I was in for. I didn't realize that the buildings and bridges on display were made mostly out of organic materials - nuts, leaves, trees, bark, and other plant materials. Gorgeous structures with even the tiniest of architectural details attended to. With acorns! And twigs! And gumball plants! I also didn't realize that Paul Busse and his team had created old world New York. It's truly a love letter to demolished buildings of long ago - from the old mansions of Fifth Avenue to my beloved old Penn Station. The structures they've built make you want to find the actual pictures of the buildings to compare, and then curse the decision-makers (again) for razing the buildings in the first place. The trains were probably third on my list. You know I love my model trains. Love seeing tiny dioramas with the trains wending their way through small town and big city America. But, these G-scale trains are a little different. They had some cool trains, to be sure, Santa Fes and B&Os and Penns, and trolleys, etc., running through each section and on each bridge. But, the inclusion of Thomas, ladybugs and butterfly trains kind of throws it off for me. Clearly, they're for the kids, but it took away some of the "realism" for me. And speaking of. Oh. My. Word. What I wouldn't give for time to wander through the Enid Haupt Conservatory by myself, without tons of screaming, rambunctious toddlers and big groups of adults. You'd probably never see me again. Ever. 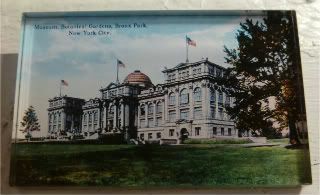 Though I love this historical postcard magnet, it's really of the museum building that's up in Bronx Park. I've now been to the botanical gardens twice there - years ago, for the Chihuly exhibit and then for the trains this week, but I've never actually made it to this building. Oh well, I guess there's always next year. And there will be a next year if I'm still in New York. I have years to make up for, having missed so many years of the holiday train show. I'd actually take advantage of the EXPRESS code that gives you a $14 entry fee (until the 17th) again this week, but DCsis shared with me that the U.S. Botanical Garden has a Garden Railway exhibit, too, showcasing Busse's work of DC buildings, and on a larger, global scale! Oh, yes. Expect there to be a second magnet on garden railways. In the meantime, here's the ubersuperdupercool photo album from this week's trip. Some gorgeous stuff, and well worth the visit uptown!